My preps of beads+DNA (biotin-tagged DNA linked to streptavidin-coated polystyrene or magnetic beads) typically contain dense clumps of beads - sometimes more of the beads are in these clumps than are solitary or in small groups. This is a big problem, partly because the tweezers work requires isolated beads and partly because I can't accurately measure the properties of the preps. It's pretty clear that the clumping is caused by the biotin-tagged DNA. Adding DNase I to the preps breaks up the clumps, and there are no big clumps in preps of washed beads (no DNA) or if the beads are incubated with DNA that hasn't been biotin-tagged. The likely cause is that, if the tagging reaction worked well, both ends of each DNA fragment should have biotin tags. Such fragments can then bind to two beads, crosslinking them, and may also create DNA loops that entrap other DNA fragments. I can see several ways to reduce this problem, illustrated in the figure. 1. One strategy is to use a defined DNA substrate rather than restriction-digested chromosomal DNA, one that can be biotin-tagged at only one end. A 14 kb plasmid designed for such experiments is available, and the biophysics grad student who worked on this project modified added a H. influenzae uptake sequence to it. It's in our freezer. All I need to do is digest with XhoI, biotin-tag the ends, and then digest with EcoRI to snip off the tag at the USS end. I won't need to purify the long fragment, as the snipped-off bit shouldn't interfere with anything. The EcoRI site is only 6 bp from the Xho site; luckily the ever-useful New England Biolabs catalog tells me that EcoRI doesn't mind cutting very close to an end. 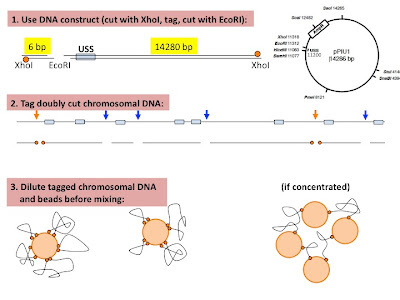 Because this fragment contains only a single uptake sequence rather than the ~1 uptake sequence per kb of chromosomal DNA, it might not be as useful for the preliminary experiments whose goal is just to get cells to bind to DNA on beads and begin uptake. 2. Another strategy is to use chromosomal DNA but reduce the number of fragments that are biotinylated at both ends, by cutting with a second restriction enzyme, one that doesn't give the appropriate DNA overhangs for the biotinylation reaction. The first enzyme should be one that cuts infrequently, giving fragments that are mostly larger than, say, 20 kb. The second enzyme should be one that cuts more frequently. Because restriction sites are randomly positioned on chromosomal DNA. this second digest would cut many but probably not all of the doubly-tagged fragments, so I'd need to find the best balance between leaving some uncut and cutting too often, producing very short singly tagged fragments and many untagged fragments. The presence of untagged fragments is probably not a serious problem, given the high affinity of streptavidin for biotin, but DNA uptake may not be easy to detect if the fragments are too short. 3. The third strategy is technically simplest, although it's the last one I thought of. I've been incubating the DNA with the beads in a small volume. For most kinds of reactions, using a high concentration of reactants is good because it increases the frequency of interactions. But streptavidin-biotin interactions have such strong affinities that this may not be an issue, especially because I can let the reactions proceed for a long time. On the other hand, once a doubly tagged DNA fragment has bound a bead at one end, using a dilute mixture will increase the chance that the biotin at the fragment's other end will bind to the same bead before it encounters a different bead. 4. (not shown) As a stopgap solution I can take the bead+DNA preps that I have and let the big clumps settle out. Alternatively, you could add soluble streptavidin. I hadn't thought of adding soluble streptavidin to block additional binding. That would work if the unwanted binding of the other end to a second bead was occurring late in the incubation, but it would require delicate timing to not block the desired first binding. Under the very dilute conditions you proposed using, the first binding event should lead to rapid binding of the other biotin to the same bead. If you want doubly-anchored DNA fragments, that's great - but otherwise soluble streptavidin might be helpful. How much washing is enough? Did the cells attach to the DNA-coated beads?